Here are just a selection of pictures featuring members of the local community we printed in the latest edition of the Skegness Standard. Pictures depict an Easter Party held at the Welcome Inn; the Mayor’s race night which raised £520 for three local charities at the Seaview Pub; the Keith’s Rescue Dogs Charity dog walk along Skegness seafront, which raised approximately £700; Great Steeoing Primary School all wore something purple, raising awareness for Epilepsy Awareness Day - and their cake sales amassed a total of £208 for an epilepsy charity; visitors enjoying a day out at The Village Church Farm in Skegness and a group who enjoyed a special cooked breakfast at Croft Village Hall, which raised £211 pounds for church funds. 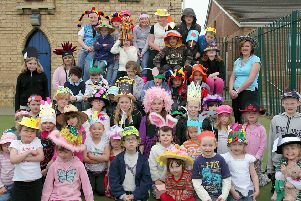 Easter was celebrated at the Welcome Inn, Skegness with fun, games and a colouring and Easter Bonnet competition. Have you got a picture you would like to send us? Remember, the Skegness Standard is what you make it! Send in your pictures and they could feature in the paper or on our website.